The powerstation USB-C 3XL can send 45W of current to the MacBook or MacBook Pro. And mophie says it can add up to 18 hours of additional use. Naturally, that will depend on how the laptop is being used. This external battery also has a USB-A port so it can simultaneously recharge a phone or tablet. This port delivers up to 12W of power. Alternatively, iPhone and iPad Pro models from last year and this can receive power from a USB-C port at up to 18W, topping them off much quicker than A USB-A connection. Priority+ Charging means that this accessory can be used to recharge your laptop while mophie’s charger is itself recharging. This won’t damage the battery, and the MacBook will get its power first. The mophie powerstation USB-C 3XL comes only in black, with an fabric wrap to reduce scratches on other gadgets in your gear bag. It’s bundled with a USB-C to USB-C cable as well as a USB-C to USB-A cable. There’s no wall charger, though. A USB-C MacBook charger should be used. Another downside of the mophie powerstation USB-C 3XL is the price: $199.95. Of course, there are cheaper alternatives. 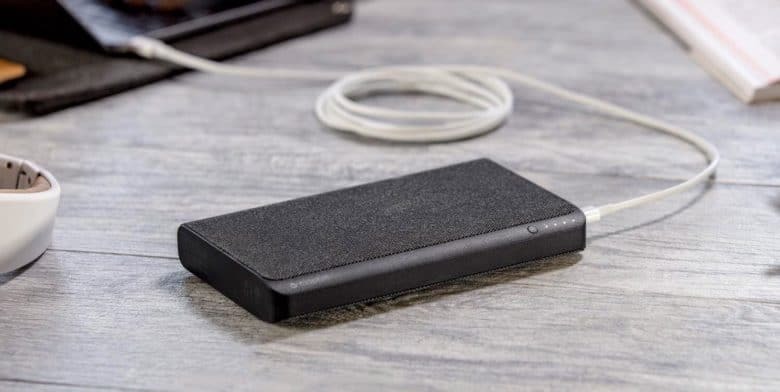 The mophie powerstation XXL offers 20,200aAh for $99.95, but it doesn’t have any USB-C ports. This accessory is available today on mophie’s website. The only other source is the Apple Store — Apple likes this accessory so much it made it an exclusive.